Innovative toric technology is at the core of these high performance daily disposable contact lenses from leading eye health experts Bausch & Lomb. 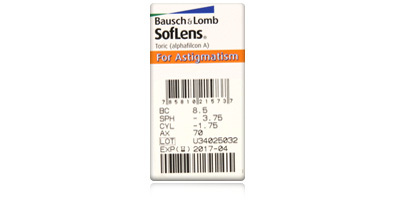 Soflens Daily Torics use High Definition Optics to correct astigmatism and decrease spherical aberration. 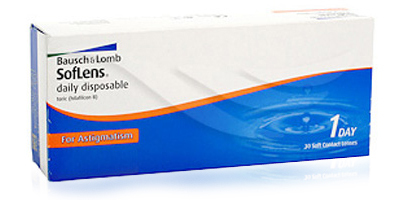 The lenses also feature ComfortMoist, a slow release hydration system which keeps eyes hydrated all day. Wearers experience exceptional vision quality thanks to the pioneering aspheric optical design of Soflens Daily Torics. The custom engineered aspheric surface improves retinal contrast. Meanwhile, High Definition Optics reduces spherical aberration over a wide range of powers and provides consistent vision in bright and dimly lit indoor and outdoor areas. 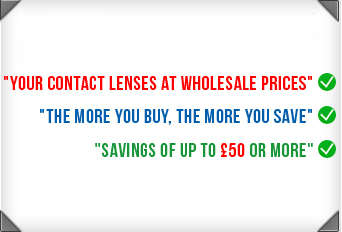 They work particularly well in low light and keep lid to lens interaction smooth and comfortable during blinking. 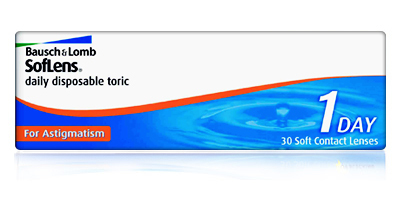 Soflens Daily Torics are made from Hilafilcon B, a non-ionic lens material that resists protein build-up, which can lead to grittiness, filming and dryness. The ergonomic blister pack makes lens removal easy, whilst the thin yet durable nature of Soflens Daily Torics coupled with a slight blue visibility tint makes them simple to apply and remove. Bausch & Lomb Soflens Daily Torics combine the quality of extended wear contact lenses with the convenience of daily disposables. If you're thinking of making the switch from monthlies to dailies, these affordable lenses are a great place to start.